Recognize your winners with this prestigious and distinguished acrylic award. The elegant colors and design will make it an award that will be cherished forever. Capri Series - Blue Trim - 4" X 6"
Capri Series - Walnut Trim - 4" X 6"
Capri Series - Blue Trim - 5" X 7"
Capri Series - Walnut Trim - 5" X 7"
Capri Series - Blue Trim - 6" X 8"
Capri Series - Walnut Trim - 6" X 8"
Capri Series - Black trim insert - 4" X 7"
Capri Series - Walnut trim insert - 4" X 7"
Capri Series - Black trim insert - 5" X 8"
Capri Series - Walnut trim insert - 5" X 8"
The 3D Curvature Sculpture series is a freestanding item with a flat back side that has a screen-printed marble design. The front face is curved to add depth to the pieces overall appearance. This item is available in various colors and three sizes. 7" x 5" x 1-1/4"
8" x 6" x 1-1/4"
9" x 7" x 1-1/4"
The 3D Star award is comprised of two pieces of acrylic that are attached using gold hardware. The top features a metallic gold star accent. This piece is currently available in only one size. 11" x 4-1/2" x 1-1/2"
The 3D Shining Star Award I is a free standing clear acrylic item that has a 3D Star in it. This piece is currently available in 3 sizes. Perfect for any recognition or award ceremony, including sports, corporate or educational applications. 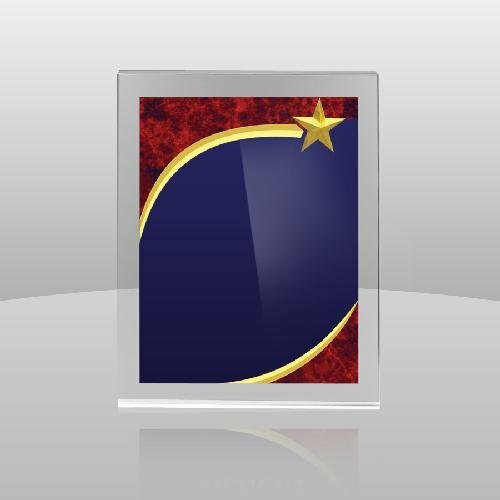 6-3/4" x 4-3/4" x 1"
The 3D Shining Star Award II is a free standing item with an arching star. This item also has a 3D star accent. This item is available in three sizes. Perfect for any recognition or award ceremony, including sports, corporate or educational applications. 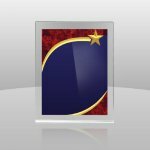 7" x 4" x 1"
The 3D Shining Star Award II is a free standing item with an arching star and an edge to edge screen print, This item also has a 3D star accent. Perfect for any recognition or award ceremony, including sports, corporate or educational applications. 6" x 3-3/4" x 1"
8" x 4-1/2" x 1"
The 3D Shining Star Award is part of our Modern Collection. The award is a piece of clear that is accented with a 3D star and is attached to a chrome metal base. Perfect for any recognition or award ceremony, including sports, corporate or educational applications. 6" x 4" x 2"
This circular star award is part of our Solitaire Collection. This clear piece of acrylic features a 3D star accent. This piece is currently available in only one size. Perfect for any recognition or award ceremony, including sports, corporate or educational applications. 6" x 5-1/2" x 1"
The 3D Star Maroon Plaque has a screen-printed design and a 3D star embellishment that cab be mounted on a wall. This item can be engraved, color-filled, or adapt color printed. This item is currently available in three sizes. 7" x 9" x 1"
8" x 10" x 1"
The Achievement Award is part of our Modern Collection. The Achievement Award is a piece of clear faceted acrylic attached to a chrome metal base. Perfect for any recognition or award ceremony, including sports, corporate or educational applications. 6-1/2" x 5-1/2" x 2"
7-1/2" x 5-1/2" x 2"
8-1/2" x 5-1/2" x 2"
The Aegis Award is part of our Modern Section and is one of our newer, more cost effective pieces. The clear acrylic beveled piece is attached to a chrome metal base. Perfect for any recognition or award ceremony, including sports, corporate or educational applications. 7-1/2" x 4-1/2" x 2"
8-1/2" x 5" x 2"
9-1/2" x 5-1/2" x 2"
The Aegis Award w/ Star is part of our Modern Section and is one of our newer, more cost effective pieces. The clear acrylic beveled piece is attached to a chrome metal base. This item comes in 3 sizes. This piece also comes with a chrome metal star that is attached using UV glue. Perfect for any recognition or award ceremony, including sports, corporate or educational applications. The American Spirit Award is a free standing item with an edge to edge screen print of an American Flag Design. This piece also features 3D stars along the top edge. 6" x 3-3\4" x 1"
7-1/2" x 4" x 1"
9" x 4-1/2" x 1"
American spirit award attached to a black acrylic beveled base. 7" x 4-1/2" x 2"
9" x 5-1/2" x 2"
American spirit award attached to piano finished rosewood base. 8" x 6" x 2-1/2"
9" x 6" x 2-1/2"
10" x 6" x 2-1/2"
The American Spirit Plaque features an American flag screen-printed design including 3D star accents. This plaque can be mounted on a wall. Reverse Bevel Arrowhead Award features a faceted piece of acrylic attached to an acrylic base. Perfect for any recognition or award ceremony, including sports, corporate or educational applications. 8-3/4" x 4" x 2"
10-3/4" x 5" x 2"
13" x 6-1/2" x 2"
Phone: 858-560-8300 Fax: 858-560-0970 Powered by BizWizard ShopKart by NetSoft Studio, LLC.